After six school days on the picket line, more then 30,000 LA public school teachers voted to accept an offer from the nation's second-largest school district that amounted to a near-total capitulation by management in favor of the teachers' broad demands: smaller classes; more aides, librarians and counselors; better school maintenance; support for a statewide moratorium on new charter schools; and releasing the cost-of-living-allowances that the state had paid to the LA Unified School District, but which the district had not passed on to the workers for several years, giving every teacher a real-terms pay-cut every year. The teachers were joined on the picket line by supporters ranging from parents' and students' groups (the students had their own demands: an end to in-school stop-and-frisk, limits on police officers and military recruiters in schools, and an emphasis on their education over their incarceration), and firefighters. 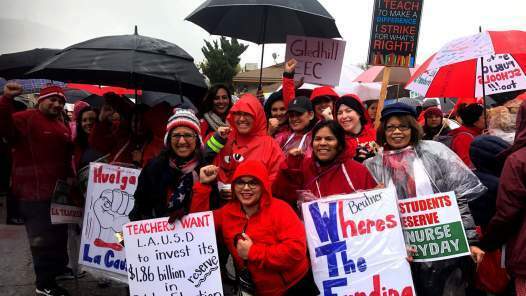 All in all, a strike by 30,000 teachers saw 60,000 people on the picket line, including teachers from LA's largest charter school. This week's Intercepted podcast features a long and informative conversation with teacher-organizers who have been on the lines; also noteworthy is Jacobin's interview with UTLA chief negotiator Arlene Inouye. Teachers in other "blue" cities and states, from Denver to Oakland, are looking to the LA teachers' example, defying the Democratic establishment and its longstanding affinity for school privatization through charter schools (see also, Cory Brooker's tone-deaf appearance this week in support of Louisiana's notoriously racist charter schools which were supercharged by the shock-doctrine looting that took place after Katrina). Nothing will be the same after this. We now have to look as a union at how we can harness all this energy — and incorporate all the new leaders that have emerged — for the struggles ahead. I think the sky’s the limit. I hope other unions will really be encouraged and inspired, and I believe they are, because I’ve been getting sent a ton of messages from across the country. We were inspired by Chicago and we were inspired by the red states. Our actions all encourage each other — and this movement is just going to grow. I’m so proud to be part of this struggle for public education, for social justice, for women, for racial justice, for all working people. And our unions are the place where we really have the power to bring this all together.